One of the most common pregnancy symptoms is pregnancy veins, these are enlarged veins usually with a bluish color that run across the breast or the stomach. Beside these kind of veins which are normal and temporary, there are other pregnancy veins symptoms that cause pain and discomfort. Here you can read more about pregnancy veins treatment and prevention methods. There are actually three kinds of pregnancy veins. The pregnant woman may find quite at early pregnancy blue veins at the breasts and blue veins at the abdominal. As mentioned above these are some of the early signs of pregnancy, where the body is beginning to prepare itself for the 9 pregnancy month waiting ahead. These blue veins on breasts and other body areas are normal and healthy! There is no need to ‘treat’ them or try to prevent them. These blue veins are temporary and will fade away after the delivery of the baby and the veins on the breasts will be invisible again. There are two more symptoms of pregnancy veins which are disturbing and can be painful too. These are the spider veins and the varicose veins. While the blue veins are at the upper body part usually, the spider and varicose veins are at the lower part of the body and most of them will be seen at the legs. Varicose veins is a blood veins disorder that happens when the valves inside the veins are failing to block blood from proceeding to the heart. The veins have many valves inside them, and these valves need to have one-way action, pumping blood only in one direction – toward the heart. When these valves are under too much blood pressure, they get ‘tired’ or ‘relaxed’ and fail to block the back-flow. This is causing blood to be pressured backward to the smaller veins, pooling and clogging. From the outside, the skin will seem full of bumps and purple twisted veins patterns, this can be painful, as varicose veins are both a cosmetic and a physical problem. There are several reasons why varicose veins appear at pregnancy, though the reasons change from each pregnant woman, they gather into a set of reasons which are common for most pregnant women. It is thought that 40% of the pregnant women will suffer from varicose veins during pregnancy, for most of them it will disappear a few month after labor, for others it will carry on as a permanent disorder. The appearance of pregnancy varicose veins is connected to the family history. Like having your moms eyes or cheekbones you may get the varicose veins. The varicose depends on the flexibility of the veins and the thickness of the valves, these are all genetic, so there is nothing you can do about it if you have the gene for varicose veins. The varicose veins symptom is very normal for pregnant women because of the main factor responsible for it is the progesterone. This hormone has a relaxing effect, allowing the huge changes for the pregnant body. One of these changes is relaxing the valves and thus causing the varicose symptom. This means that once the pregnancy is over, the valves will gain back their normal tension. The pregnancy changes create pressures at places they have not been at before. The enlarged uterus is fitting itself for supporting the developing fetus. This puts pressure upon some of the main veins and blood vessels in the pelvic region. The pressure once eased can prevent the severeness of the varicose veins symptoms. For those who were unlucky to be born to a mother who didn’t have any pregnancy varicose veins, there is still hope, as preventing pregnancy varicose veins is possible to some extent. There are several things you can do to prevent pregnancy veins, and the important way is to keep your body moving. Many people are unaware that they are standing or sitting for long periods of time. If you work standing, try to flex your feet, bend your knees, walk in the room every 15 minutes. If you are sitting for long hours, stand up, walk in the office, flex your feet, straighten your legs once in a while. Do not sit with your legs crossed. Wear loose cloth, easy belts and bands, take your shoes off when you can; do not wear tight jeans and cloth that pressure your body and prevent easy free blood circulation. High heels place a lot of tension on the calf’s and prevent free blood circulation, to prevent pregnancy veins walk in low heels or sports shoes so the leg muscles can move around the veins. Get your feet up when you can, sleep with feet higher than the heart so the blood will flow more easily. 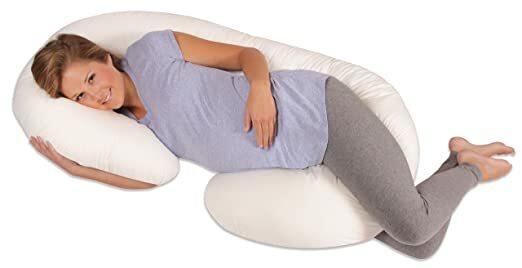 Place a pillow below legs, or between knees (there are special pregnancy pillows for these purpose). You can raise the bed at the feet so they are elevated when sleeping so the blood will flow back from the legs. One of the best advice for preventing pregnancy veins is to keep doing some mild pregnancy exercises. This can be helpful for preventing pregnancy veins and will do good for your general well being and body. Doing pregnancy exercises will also help you ‘get your body back’ after the baby is born. Do some walking when you can; park your car one block away from where you need to go; take the elevator one floor higher and go down the stairs; do some home soft exercises like bike or pedaling home equipment while you watch TV. Try to keep the exercised for 30 minutes, to get the heart pumping and the blood circulation going. The mild exercise should be a leg exercises because thats where we want to get the blood flushed from the varicose pooling. Check with your doctor before you begin any energetic exercises like bicycling, jogging or other formal sports. For more healthy exercises ideas and ways to keep your pregnant body attractive see ‘pregnancy without pounds’ program. High Fiber Diet. Eating high fiber diet foods will help prevent pregnancy constipation. Pregnancy constipation also have effect on the blood pressure to the legs and the creation of pregnancy veins. Take vitamin C supplements. Research have found that vitamin C can help lower the pregnancy veins symptoms, by the fact that it supports the body production for the elastic components it needs for the elastic veins and valves. The veins needs to be elastic and firm to be able to stand the blood pressure and close tightly to prevent the blood back-flow. Two important ways to prevent pregnancy veins trouble and treat this symptom, is to keep pregnancy weight controlled and change to high fiber diet. Pregnancy weight control. Varicose veins is common for pregnant women and overweight people. The pregnancy overweight is unhealthy for you and for the baby. For many reasons women find that keeping the weight controlled is more difficult when pregnant. Try to learn how to keep those extra pregnancy pounds off, how to eat healthy and exercise with workout that is suitable for pregnant women. Once you get the unwanted extra pounds off, the pressure on the veins will decrease which will help them get the flexibility back. Getting some pounds off will make you feel more attractive (and motivated to keep going) and help you later on lose the disturbing pounds after the baby is born. This entry was posted in pregnancy varicose veins and tagged blue veins, Blue veins sign of pregnancy, pregnancy spider veins, pregnancy symptoms, pregnancy varicose veins, Pregnancy Veins, spider veins pain, varicose veins ankle pain, varicose veins calf pain, varicose veins during pregnancy, varicose veins foot pain, varicose veins knee pain, varicose veins pain, Varicose Veins Pain Relief, Varicose Veins Pain Treatment by admin. Bookmark the permalink.